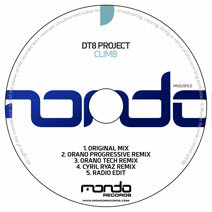 The DT8 Project production power house continues with the latest single 'Climb'. After starting 2018 with 'The Gate', Darren Tate (aka DT8 Project) is back with another masterpiece from his much loved DT8 Project brand. When you look back at some of the seminal DT8 classics such as 'Destination', 'The Sun Is Shining', 'Winter' and 'Hold Me Till The End', you wonder how such a prolific producer can top those. Well as you'd expect, the latest offering from DT8 Project is nothing short of breath taking. Lush, uplifting melodies, emotive chords and a lush vocal hook over the top will send shivers down your spine. If that wasn't enough, we have employed the talents of two Mondo Records stars - first up is Orano, who you will remember from his breath taking debut single 'Fairytales'. He delivers not one, but two interpretations of 'Climb'. One mix to which keeps the progressive vibe of the original and another mix which spins the track in a no nonsense tech trance direction. Following up those mixes is a slamming, uplifting remix from rising Mondo Records star Cyril Ryaz. Cyril of course is no stranger to crafting banging trance moments and pulls out all the stops for this killer remix. Another classic in the making here from DT8 Project - do not miss it! Summer wouldn't be complete without a splash of DT8 Project magic in it, and this summer is no exception. Darren Tate returns under one of his most prolific guises 'DT8 Project' to..
After stirring up the trance scene with this unique mashup, Colonial One's visionary bootleg which teams the sublime trance melodies of Ultimate's 'Wonderland' and the sumptuous vo..
Electronic visionary and pioneer Darren Tate returns under his much loved and critically acclaimed DT8 Project guise. Having given fans quintessential cuts over the years such as ‘..
DT8 Project (aka Darren Tate) is back on Mondo Records with his latest single 'Let It Go'. Famous for crafting those lush, emotional and unforgettable melodies such as 'The Sun Is ..
Orano returns to home turf with his latest summer anthem in the form of 'Inca'. After the huge success of his singles 'Fairytales' and 'It's Alright', Orano has a lot to live up to..